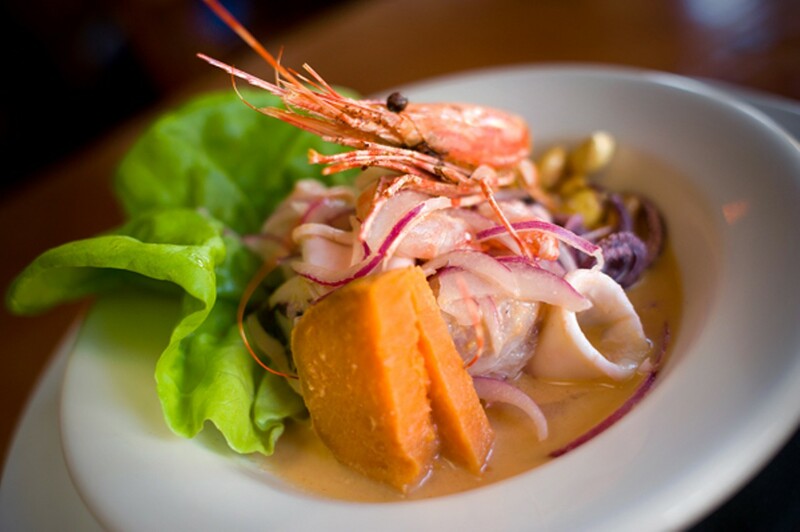 Pucquio serves elegant, high-end Peruvian cuisine out of a small Oakland kitchen. The Mixto cebiche is in a class of its own. Pescado al Ajo ... M.P. After my first meal at Pucquio, the new Peruvian restaurant located in the former Guest Chef space in Rockridge, I thought of that old saw about pupils surpassing their masters. Or, as the Chinese say, "The blue from the indigo plant yields an even deeper shade of blue." How else to describe what happens when a little-known pop-up takes over the restaurant wherein it first "popped up" and — from day one, it seems — puts out food that's tastier, and more exciting, than anything I ever ate at the original pop-up host? I expect the personal touches will come with time. Moreira told me they're still in the process of changing everything over to the "Pucquio" name. But as far as the actual food is concerned, Pucquio has hit the ground running. I don't know of another Peruvian restaurant in the East Bay that's serving food that's as good or as ambitious. According to Moreira, his concept is "contemporary Peruvian street food" — dishes inspired by what long-haul truck drivers in Peru might stop to eat at roadside eateries along the coastal highways. But there's nothing especially "street" about the food. The presentations are elegant; the skill and technique wouldn't be out of place at any fine-dining temple of gastronomy. Check out the knife work on the refreshing cold quinoa salad, for instance — the precise, tiny cubes of red onion, cucumber, and chili pepper that dot the plate. Or take the pulpo al olivo: Gently steamed slices of octopus serve as a "crostini" base for an aioli made with Peruvian Botija olives — Moreira's riff on a tapenade. It was as magical as any molecular-gastronomical concoction: the briny essence of olives distilled into something as airy and light as a cloud. Any conversation about Pucquio needs to begin and end with its cebiches — not "ceviches," Moreira stressed. Though both spellings are acceptable, Moreira wanted to emphasize the dish's Peruvian origin and set it apart from the tomato-based Mexican ceviches diners might be more familiar with. Whatever the spelling, I often find this dish excessively limey and one-note, with an unappealing texture. 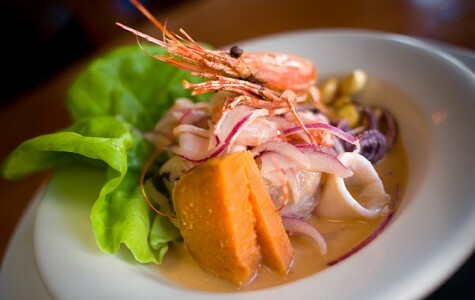 But Pucquio's Mixto cebiche is in an entirely different league. Moreira mixes delicate raw shrimp, tender cubes of California sea bass, whole squid (fresh enough that you get a squirt of black ink when you bite in), soft yams, and, to top it all off, a fried shrimp head. There was so much going on — the lime-juice zing, the no-joke heat of a rococo chili emulsion, the sweetness of the yams and shrimp, the crunch and intense umami of that head — yet everything was perfectly balanced. It's the cebiche I'll use to judge all future cebiches. Less spectacular, but also enjoyable, was the Moreno cebiche. Served in a martini glass, this version featured oysters and littleneck clams sitting in a pool of squid ink, which we threw back like a cocktail, savoring its murky ocean richness. Main dishes also didn't disappoint. The lomo saltado spoke to Peruvian cuisine's Chinese-immigrant influence. It's a classic beef and tomato stir-fry, but Moreira's modern version was presented more prettily and used higher-quality meat. On one side of the long rectangular plate was a mound of rice; on the other was a little tower of French fries. Most impressive was the pescado al ajo, a whole fried daurade fish that arrived on the plate sitting upright and curled around a mound of tender stewed chard. The fish itself was great — crisp-skinned and firm-fleshed — but the key to the dish was an intensely garlicky sauce that added deep soulfulness to every bite. After picking the fish's bones clean, we got to work on the most satisfying bits: the cheeks, the eyes, and the pieces of soft cartilage inside the head. My only complaint was that we wished for more sauce and more vegetables. As it was, we nearly licked the plate clean. Mind you, the prices at Pucquio aren't low. But considering the quality, it's worth the splurge, and the $35 three-course prix fixe is a great value. Two budget-conscious diners could share that, but you'd want to add at least one of the cebiches and an extra side dish to round out your meal. And, though the prix-fixe comes with a dessert of the chef's choosing, I'd be remiss if I didn't recommend the bombitas de carretilla: beignets filled with an airy sweet-potato purée, served over a boozy, pisco-spiked crème anglaise. Yes, they were doughnuts, but like everything else at Pucquio, they were made with elegance and a light touch that was impossible to resist.